Up until recently, I resisted having a writing desk. I had one when I first moved to Vancouver from the Sunshine Coast, because I assumed it was proper for a writer to have somewhere to sit down and write, and all I wanted was to be a writer. Hadn’t I moved from my small town for just that purpose? What I found was that the desk was soon piled with dirty laundry and old coffee cups, stacks of first pages and dust. And then, somewhere in my early twenties, a particularly turbulent time in my life, I decided to get rid of most of the things I owned including the desk. I favoured space and the freedom of not owning things I couldn’t easily move in a hurry if I needed to. There’s so much attachment to where and how we’re supposed to write. Throughout my BFA and MFA I obsessed over how other writers managed to form and feed a writing habit. I tried to get up early and stay up late to write. I tried coffee shops and outside at parks when the rain in Vancouver held off long enough. I tried 90 minutes a day. I tried 2000 words a day. All of these things worked for a little while, and sometimes still do. I used to joke that I was scared of commitment and that this fear stretched far past my work and romantic life and bled into my ability to sit in the same spot and write day after day. It’s hard to catch stability in Vancouver right now. What they say about renting here is true. Last year, my partner and I lived in an apartment where the floors were so slanted that we worried our furniture would slowly pool into the center of the living room while we slept at night. 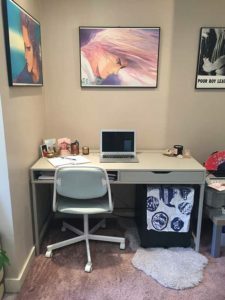 That was my first apartment after finishing both school and my first long writing project, and I decided it was time to slow the constant movement that had been my twenties and get myself a damn writing desk again, somewhere solid where I could focus. I wanted to stop moving every year or every six months. I found a desk for free on craigslist and I pushed it into the corner of our slanted living and I made it work for a while, until a hole formed in our roof and it started raining in our living room. Another move and a new apartment, this one without the unintentional skylight. The old writing desk didn’t last long, as it’s legs were already unsteady when I collected it off the side of the road. We’ve been in our new apartment for just over a year. A few months ago I bought a new desk. I keep my grandma’s letter opener, some cards and pictures, and some candles and crystals on it, but I otherwise try to keep it clear. I anticipate having to move again in the not too distant future. So goes life right now. Along the way I’ve managed to keep writing, although it’s never looked particularly steady or taken on a shape that I can offer as advice to other writers, other than to say situation and places and people and desires might change, and you just have to keep finding a place to sit and get some words down, however that might look to you.